The American Tobacco Company, one of the first giant holding companies in American industry, was incorporated in North Carolina on 31 Jan. 1890 by James B. Duke. Duke's father, Washington, had become a successful small manufacturer of tobacco after the Civil War. His son Brodie, seeing little opportunity in a small rural tobacco factory, moved to Durham in 1869. There he began to produce smoking tobacco; five years later, Washington and his two other sons, James B. and Benjamin N., moved to Durham and combined forces with Brodie to build a factory for their joint use. The Dukes formed the firm of W. Duke, Sons and Company in 1878 to raise needed capital for the growth of their business. Soon substantial profits were pouring in, and the Dukes reinvested the money in the business for continued expansion. During this period, the youngest son, James, emerged as the true leader of the enterprise. The leading manufacturer of smoking tobacco in Durham at the time was the William T. Blackwell Company, with its famous Bull Durham label. The sales of W. Duke, Sons and Company's brand Duke of Durham lagged behind that of Bull Durham. James B. Duke, always the visionary, realized the cigarette had great potential for the future if a machine for mass production could be perfected. In the early 1880s, James Bonsack of Virginia invented such a machine. Before the end of the decade, James B. Duke had gained exclusive control of the Bonsack machine and soon had a monopoly on the American cigarette industry. He took over the nation's five major cigarette manufacturers, which were centered in Richmond, Va., and New York City. Duke's newly formed American Tobacco Company (or Trust) encompassed practically all of the small smoking tobacco firms and most of the chewing tobacco producers in the nation. Major firms absorbed in North Carolina included R. J. Reynolds of Winston-Salem, W. T. Blackwell of Durham, and F. R. Penn of Reidsville. In 1904 Duke reorganized his many tobacco firms into a single corporation. By 1906 American Tobacco controlled four-fifths of the entire domestic tobacco industry other than cigars. In 1907 a federal court ruled that American Tobacco had a monopoly on licorice, a flavoring, and that the company was guilty of violating the Sherman Antitrust Act. After a long trial, the court prohibited the company from enjoying interstate trade until conditions were corrected. The ruling was appealed to the U.S. Supreme Court, which decided on 29 May 1911 that the company had to be dissolved. On 16 Nov. 1911 the Supreme Court issued a decree that the company had to be divided into three major parts: American Tobacco, Liggett and Myers, and P. Lorillard. The control of R. J. Reynolds Tobacco Company of Winston-Salem was also relinquished. James B. Duke, a multimillionaire by then, retired from active management of the American companies and turned his attention to other interests, including the generation of hydroelectric power and the creation of Duke University in Durham. After the breakup of American Tobacco in 1911, the restructured company concentrated its tobacco manufacturing in Durham and Reidsville, N.C.; Louisville, Ky.; and Richmond, Va. The Durham facility had been built by the Duke family and included the former William T. Blackwell plant. The Reidsville plant was the former F. R. Penn Tobacco Company, which the American Tobacco Company had purchased shortly before the dissolution of the American Tobacco Trust in 1911. 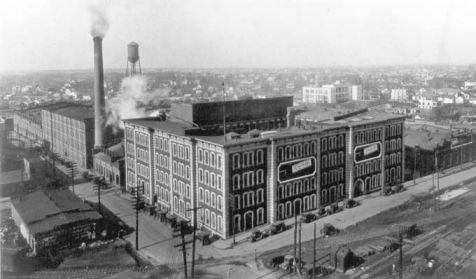 American Tobacco purchased the Penn plant in 1911, and Penn's sons, Charles and T. Jeff, continued to work for the corporation. Charles A. Penn became a director of American Tobacco in 1911 and the vice president of manufacturing in 1916. He perfected the blend for a new cigarette known as Lucky Strike, which was later to become one of the leading brands in the history of the industry. Mainly through Charles Penn's efforts, the former Penn plant was enlarged for the production of Lucky Strike, and Reidsville soon became one of American Tobacco's four major production centers. American Tobacco Company began to diversify in the 1960s and moved into other fields, including distilled spirits, life insurance, office supplies, cosmetics, and hardware. In 1968 the various components of the company were reorganized into a new corporation, American Brands, Inc. As its older tobacco manufacturing plants became outmoded, the company began to concentrate its cigarette production in Reidsville. It closed its Louisville plants in 1971, its Richmond plants in 1981, and its Durham plants in 1987. The manufacturing complex in Reidsville was expanded to accommodate the increased production. In 1986 the American Tobacco Company became a subsidiary of American Brands, making it one of the largest cigarette producers in the United States. As Gallaher, Ltd., it also became the leading cigarette producer in the United Kingdom. Through the work of the Historic Preservation Society of Durham and various developers in the 1980s, the tobacco district of downtown Durham began to be restored and transformed into a thriving urban center featuring apartment complexes, restaurants, and unique retail stores. The 14 acres of the American Tobacco Historic District was at the heart of Durham's renewal. By 2004 its massive red-brick buildings had undergone a $200 million renovation financed by Capital Broadcasting Company and was serving as attractive office space for a variety of tenants. American Tobacco Company, The American Tobacco Story (1962). Durden, Bold Entrepreneur: A Life of James B. Duke (2003). Michael Orey, Assuming the Risk: The Mavericks, the Lawyers, and the Whistleblowers Who Beat Big Tobacco (1999). American Tobacco Company factory, circa 1926. Image courtesy of Preservation Durham, UNC Libraries. Available from http://mainstreet.lib.unc.edu/projects/tobacco_durham/index.php/markers/view/8 (accessed June 27, 2012). 1 January 2006 | Carter, Robert W., Jr.
there was an advertisement on JUUL Vapor to purchase with nicotine. I thought all nicotine advertisements were band from commercials. I have an applicant for an apartment that is receiving a pension from her husband from the American Tobacco Company. Could you give me a phone number or address that she could get information and confirm her pension? Thank you for your assistance. Hi, i would like to know if you have any information about the american tobacco company profit-sharing plan.i have a piece of paper dated 2/10/61 from your charleston Branch.this document belongs to my grandmother.any information concerning this document, please email it to me. I helped to inspect the American Tobacco Facility in 1993 prior to it’s refurbishment for residential and commercial use. At that time it had been closed for a number of years, but the 26 original buildings stood much as they had the day the doors were closed, except for the removal of heavy equipment. There was still cured tobacco on the conveyor belts and if you passed your hand through it the sweet smell of tobacco would waft in the air. At the time there were a number of contaminants like asbestos in the facility, but they have apparently all been abated now. It is remarkable to walk through this complex currently; by two of the oldest tobacco warehouses in the State on the northwest corner, south by progressively more current buildings all of which are brick until you reach the newest cast concrete structures on the south end of the facility. (The new parking deck replaces several brick buildings that originally stood on the southwest corner). There was a rail line in the middle of the campus that allowed rail cars to dump coal into a hopper that fed a conveyor to the massive boilers in the power plant in the center of it all which now houses a movie theater. I was pleasantly surprised to see the vibrant campus when I passed through again recently after 25 years. I have an old Lucky Strike cigarette case. Can you help me find where Factory #30, District of N.C. would have been located for the American Tobacco company? Thank you for visiting NCpedia and for sharing your question. I am forwarding it to reference librarians at the NC Government & Heritage Library. A reference librarian will contact you shortly to help suggest resources. Hi there! My students are learning about the history of tobacco in NC. They learned that at one time in history NC had 126 factories running. They then asked me how many factories in NC are still operational. I've googled and haven't found a definite answer. Do you have an answer?